I enjoyed this lasagna. Jess didn't even want to try it, but she is pregnant so you can't really trust her judgement. It turned out well and I got to use some fresh veggies that my Nana gave to us. Though good, it was not my favorite lasagna ever because I tend to enjoy the lasagnas with meat more than those without. I did leave out the roasted red peppers accidentally, but I don't think that it caused a massive change in the outcome. Grease a 9 x 13 ovenproof pan. Heat the EVOO in a large skillet over medium-high heat. Once heated add the bell pepper, zucchini, yellow squash and broccoli and cook for about 5 minutes. Remove from heat, stir in the roasted red peppers and the red pepper flakes, and set aside. In a bowl, mix the goat cheese, ricotta cheese, garlic, thyme, and oregano until combined. 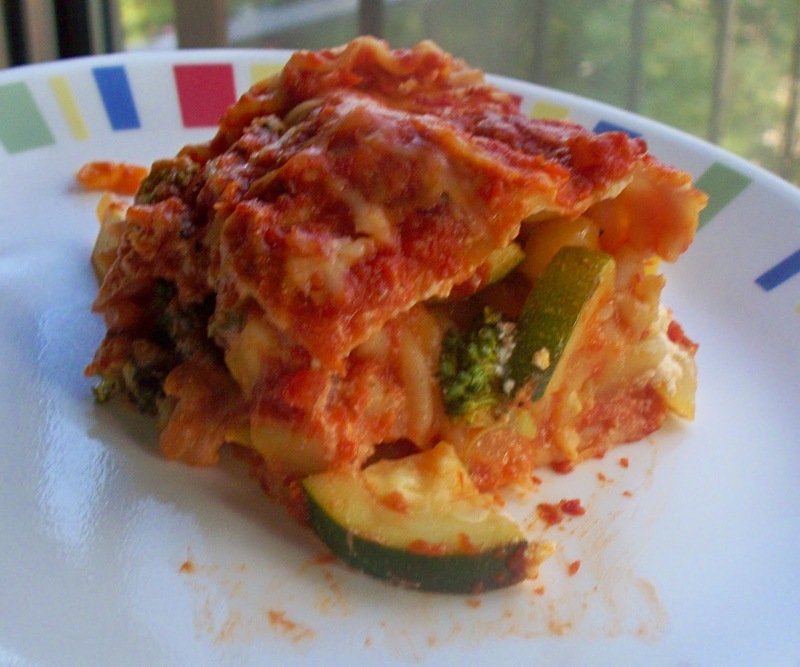 In the greased pan, layer from the bottom up; 1 cup marinara, 1/3 of the lasagna noodles, 1/2 the vegetables, 1/2 the cheese mixture (you will need to carefully spread this with a spatula/fork), 1 1/2 cup marinara, 1/3 of the lasagna noodles, the remaining vegetable, the remaining cheese mixture (again you will need to spread this), the remaining lasagna noodles, the remaining marinara, and top it off with the Parmigianno-Reggiano. Cover the whole pan with aluminum foil and bake for 45 minutes. Remove the cover and cook for an additional 15 minutes. After removing it from the oven, let it sit for about 10 minutes. After plating a serving, garnish the slice with the chopped parsley. Side note: The recipe stated that this would make 8 servings, but I cut it into 12 slices and no one went hungry with the diminished serving size. Did I miss the pregnancy announcement? Congratulations!